Even though I haven't been blogging, I have been baking quite a bit. Other than my weekly loaves, lately it's been mostly non-bread. Like these spicy ginger molasses cookies. The cookies contained grated fresh ginger and dried ground ginger. Other spices in the cookies were green cardamon, black pepper, cloves and cinnamon. Super spicy and gingery. Not for the faint of heart. I had some extra egg whites and was too lazy to make macarons, so I baked meringue clouds. 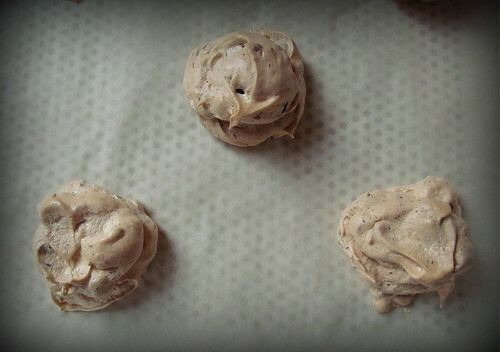 These are not the crunchy meringue cookies that are baked low and slow for a long time to dry them out. These were baked at 325F for about 20 minutes. They were light as air and almost collapsed in my hand as I picked them up. The insides were still soft and barely held in all the toasted hazelnuts and bits of chopped chocolate. These pecan cookies are adapted from a King ArthurFlour recipe. I doubled the amount of pecans and I used toffee bits instead butterscotch chips. Even though I chilled the cookie dough for 24 hours, the toffee bits made the cookies spread out. I was afraid the cookies would be fragile due to the thinness, but they held together nicely. The coating was granulated sugar with fleur de sel. I loved the sweet and salty. My super duper low maintenance starter has been in the refrigerator unfed for 17 weeks now and it still looks almost as good as new. There's a teeny bit of gray hooch but no mold or dark spots.I just take about 6-8 grams from the jar every week and build it up as necessary for baking. For an excellent reference on this no muss no fuss starter maintenance, please read dabrownman's primer at http://www.thefreshloaf.com/node/40918/no-muss-no-fuss-starter. 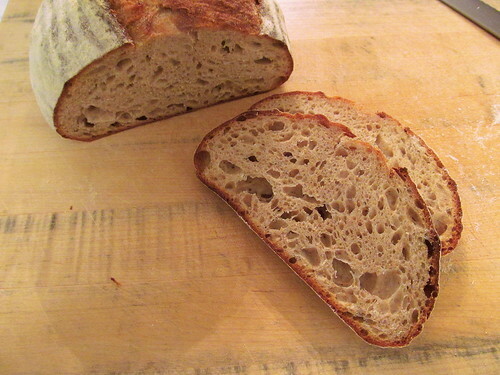 One of my weekly loaves is David's San Joaquin sourdough. I haven't made focaccia in a while so I made some last week instead of my weekly levain. I used Nancy Silverton's focaccia recipe as published in the LA Times, but I increased the rye flour and added some whole wheat flour too. I didn't add toppings to my focaccia this time since I wanted the flexibility of a plain focaccia. I just used a generous sprinkling of Maldon sea salt. I followed the method outlined in the the LA Times article, but I used two 9x2-inch round cake pans because I like my focaccia taller. The original recipe calls for two 10-inch round pans. In the parentheses below I listed the baker's percentages that I used. Overall hydration was 78%. As usual with this recipe, it was absolutely delicious. I'm sure the fact that the dough pretty much bakes in a pool of olive oil didn't hurt the cause either. 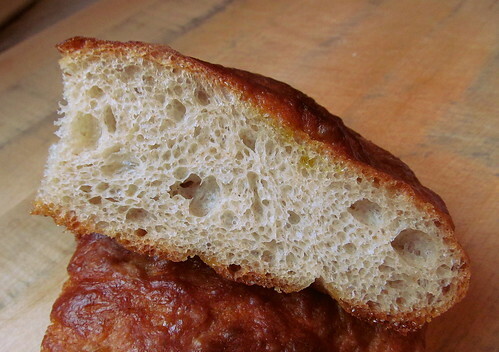 The crumb wasn't as open as some batches of focaccia I've made in the past, but like some people say "You can't eat the holes". Nice to see a post from you Mary. Your cookies and breads look great. I love the look of your focaccia. Haven't made a focaccia in a while and want to try this one. I've been super busy at work the past few weeks and will finally have a little time off over the holidays. I'm looking forward to doing some serious bread baking while I'm off. 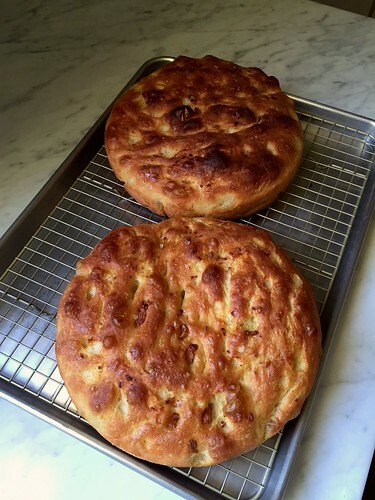 Do try the focaccia recipe if you get a chance. The clouds were amazing. I had to stop eating them or I wouldn't have enough for the cookie exchange! Luckily they are really easy to make so I plan on making more for Xmas. 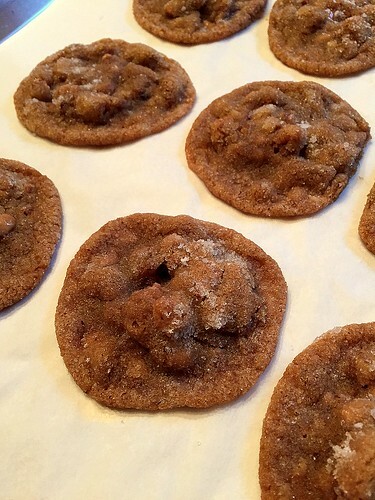 I used Barbados molasses in the cookies and I think it made a big difference in the flavor. I didn't intend on letting my starter get to 17 weeks, but it just kinda happened since I'm not baking as much as I would like. But now I'm just curious to see how much longer I can keep it before bad things start to grow in there!